At long last, the season finale of Whodunnit?! But whose murder would the players be investigating this week? With a kidnapped butler, a room full of smoke, and a disappearing contestant, things were off to a very strange start. When Giles brought us back to the present, the smoke had cleared and Melina was missing. So many theories at this point, but it was pretty clear that either Melina was the Killer, or she was about to be murdered. The players tried to figure out what to do next, and for a moment I thought they would actually end up splitting up and searching the house for clues. Instead, the Killer broadcast a creepy message over the TV that began a puzzle for them to solve. 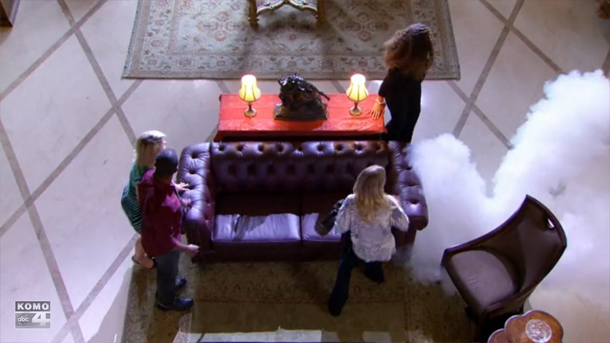 The players had to recall the combination Ronnie found in the very first episode of the show and use it to unlock a secret door in the great room. Nobody could remember the number, but Kam was quick to notice that various items in the parlor had been arranged in a 6-1-3 formation. He entered the combination with Cris and Lindsey by his side, and they entered the mysterious room. So Melina was not the Killer! Maybe she really did make all of those amazing deductions about Ronnie’s death last week. Unfortunately, they weren’t enough to keep her alive. At this point, the team officially dissolved and there was a little montage of accusations against each player. Back out in the great room, the players found three large boards, one for each of them, with a sort of board game track in the shape of a question mark and a monitor at the top. Giles began the complicated explanation of the players’ final task — a race to collect the nine black puzzle pieces that fill up the board and unlock the Killer’s hideout. In the only fun twist of the episode, the gruesome re-animated corpses of each of the previous victims marched down the stairs and hobbled to different locations in and around the mansion. The remaining players would need to visit each victim and complete their challenge to get each puzzle piece. One caveat — if players did a challenge incorrectly, they would actually receive a sort of “dud” puzzle piece, and wouldn’t find out until they had gathered all 9 pieces the board. For any duds, players would need to go back to the challenge and try again. Kam’s advantage for solving the first riddle was a free puzzle piece to get started. Challenge: Use a slingshot to break the glass in a small fish tank, choosing the one that correctly shows which direction Sheri was facing when she was hit. Performance: I was surprised that a slingshot could actually break a hole in a fish tank! Lindsey was the only player to have trouble getting enough power from the slingshot (or the only one they showed having trouble). Challenge: Recall whether the Killer gave Dontae a medallion of St. Agatha or St. Elmo. Performance: Even Lindsey balked at how easy this challenge was. Strange, since they had the excellent option of asking St. Agatha or St. Agnes, a lie the players concocted and couldn’t keep straight themselves. Challenge: Re-assemble a bomb and cut the wire that corresponds to the text on the TV message Adrianna saw (red or blue). Performance: Another instance where Kam hadn’t actually seen the clue that was being referenced. But all three players got this one just fine. Challenge: Arrange five pieces of a diagram to show how the Killer placed the mountain lion in the secret compartment. Performance: This one confused me at first since I thought it was asking how Don triggered the lion trap. Cris had no problem, but Kam had to go back three times before he got the right order. Challenge: In the bushes, retrieve the snake planted in Ulysses’s saddle bag and put it in a basket. Challenge: Complete a spot-the-difference photo puzzle, and submit your guess for how many differences there were (between 3 and 7). Performance: Cris and Lindsey both had trouble with this one and had to go back. Kind of tough! Challenge: Go in a dark room and bring out the item that wasn’t involved in Geno’s murder (gun, night vision goggles, or flower lei). Performance: Kam and Lindsey had no problem, while Cris supposedly read the instructions too quickly and brought out an item that was involved in the murder. She ended up having to re-do this one. Challenge – Identify and retrieve a castor bean from the hot tub. Performance: I guess everybody did okay on this one! Challenge: Read Giles’s contract and determine whether or not he is the Killer. Performance: This one was just weird and awkward, with Giles suddenly having escaped on his own and acting suspicious. Kam interpreted Giles’s contract to mean he was essentially a murderer with all the things he agreed to do, but apparently in the fine print (mentioned in the riddle), an addendum relieved Giles of all liability. Kam was the only player who had to go back (all the way up to the attic!) to try again. I was really excited about this big, multi-step challenge when it started. The idea of revisiting each murder was really appealing, and I also liked the idea of testing the various skills that make someone a worthy adversary for the Killer. Unfortunately, I think some of the challenges fell a little flat and it ended up being more of a foot race than anything. While it would have been really frustrating for players to have to keep running back and forth any more than they did already, I think the challenges could have been designed in a way that took a little more time and thought. I guess that would make it less suspenseful though? Also, holy crap did that become a physical challenge! The players were all sweating profusely by the end, after running around the house and up and down the stairs and everything else. I like suspense and action as much as the next American TV viewer, but it made me ache for the subtle intellectualism of The Mole. And how weird was the thing with Giles? Suddenly, all of the narrative stakes they set up at the beginning of the episode are gone. Melina is dead and Giles is free. Now we keep playing this game anyway until one of us is killed? It just felt really strange. It’s hard to tell with the editing, but it appeared that Kam kept his lead in the challenge despite having a couple of hangups along the way. Cris followed closely behind, while Lindsey’s slingshot problems appeared to slow her down to third place. 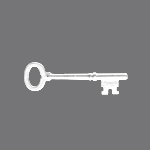 Kam’s correct board unlocked a key and gave him a message to go upstairs to a secret room and solve another riddle. Cris’s message was not shown, but she followed Kam. Lindsey received a different message that was more congratulatory and pointed her back to the Killer’s storage room. Kam and Cris entered yet another one of the Killer’s hideouts, this one filled with paperwork and connection boards and surveillance monitors. Kam and Cris huffed and puffed while they searched the room for the next riddle to no avail. Eventually, Cris awkwardly asked Kam if “The Killer is you?” before bringing his attention to the surveillance monitor that showed the inevitable: Lindsey getting shot through the neck by an automated suit of armor wielding a bow and arrow. Meaningful looks at each other! Commercial break! Okay, it’s the big moment! The big reveal! How are they going to do it?? Accusations from both sides! Cris is speaking strangely… because she is speaking in rhymes! A Killer is Cris! Kam is floored! He thought it was Lindsey! And now a montage? Each death with Cris smiling under the hood? Yeah okay. This is taking forever! More awkward exchanges between Kam and Cris… Okay good, Giles is here to wrap things up. Yes, good job Kam! You did it! Now handcuff Cris and send her away. Really? Cris is completely compliant. What? Oh look, the cops are even here! This all makes sense? That cop car is going to explode and she’s going to make her big escape, right? No? Okay. More congratulations for Kam! Hooray! Keep saying he did it! WHAT THE HELL IS GOING ON. The finale episode highlighted the three major problems of the entire show: 1) It doesn’t matter who the Killer is (Kam won without ever suspecting Cris, and Lindsey lost despite suspecting Cris from the beginning), because 2) There is no way to tell who the Killer is, because 3) The Killer has no motivation whatsoever. The Killer has no motivation throughout the show. This means that the narrative is completely unbelievable and full of holes. And when I say unbelievable, I don’t mean unbelievable like hey they had those corpses come back to life, and that’s totally unbelievable, and therefore my point is refuted. I mean unbelievable like wait, what? That doesn’t make any sense, it’s not how a real person would act, it doesn’t explain anything, and it doesn’t respect my intelligence or my investment in this show all summer. Cris invited these players to play her Killer’s Game. She has the money and means to coerce two maids and a butler to do her bidding in this expensive mansion. She apparently knows from the beginning that she will be handcuffed and taken away by the police at the end of the game, despite probably being capable of some dramatic escape. Why? Why would she do that? Her only goal is supposedly to find a worthy adversary. For what? To pine after while she rots in jail? Nick and I (mostly Nick) came up with the following alternate ending: Kam goes to the mystery room alone and witnesses Cris murdering Lindsey via the surveillance monitors. Cris addresses Kam directly via the camera, congratulating him on being the one to survive, but saying that she won’t be caught so easily. She then makes a daring escape using some exciting special effects. By the time Kam and Giles make it back downstairs to reach her, she is already long gone, but she has left him the money she promised (she is nothing if not honorable). Now Cris has fulfilled her motivation to find an adversary without stupidly walking herself straight into jail. AND you have a great set-up for a cameo in later seasons. The only thing you lose is Kam “unmasking” the Killer as promised, which, quite frankly, he didn’t even do. It was clear throughout the season that the “the Killer is among you” catch was just being used as a gimmick with no real weight, but the finale really highlighted the holes this left in the narrative and the gameplay itself. They put this big emphasis on the “who” but then didn’t incorporate it into the gameplay whatsoever. They could have removed the “who” element from the show completely and just focused on deduction skills and team play (which is what the core gameplay was revealed to be). Focusing on the “who” without following through did not serve the show in any way and only set viewers up for disappointment. It just feels like so many of the elements that made up this lackluster finale could have been avoided. When a show has hundreds of staff working on it and hundreds of thousands of dollars being spent per day, I want the things that don’t cost money, the things that just require someone sitting and thinking hard about it until they come up with something that works, I want those things to be rock solid. I can understand the idea of wanting to keep the show simple and accessible to viewers. But if there is one thing summer reality TV show viewers like, it’s feeling smarter than the TV. It just feels like people are going to watch that finale and say “The Killer went through all that just to let herself get arrested? That’s so stupid!” or “The person who knew who the Killer was lost, and the winner never even suspected the Killer? What a waste of time.” And that’s not a good way to get people interested in a second season. If a second season was run exactly the way this one was, I’m not even sure I’d be interested enough to keep up. While the show was enjoyable overall, I kept feeling like I was being set up for something really great and exciting, only to be let down by something simple and cliched (or even nonsensical). Die-hard fans eat this sort of show up, and viewers were all over reddit dissecting screenshots and comparing theories, going down the usual paths of this kind of show. In spite of the show’s basic format, we looked hard for clues that were not really there. Something extra hidden in the great room drawer. The mention of zodiac signs on the Killer’s connection boards. The victims’ post-death confessions. A mysterious Rue Manor crest above the door handle. All are now revealed as unintentional oversights or just shorthand for “mysterious” with no real meaning or consequence. I’m very interested to see whether this gets picked up for a second season. The Mole focused on smart, tricky gameplay, but might have lacked the action and pacing viewers like. 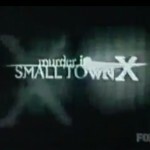 Murder in Small Town X was a fascinating study in narrative that was perhaps too complex for viewers. Now, Whodunnit? 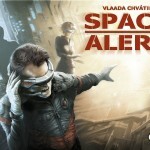 tests the power of special effects and faux-drama while neglecting meaningful gameplay and a solvable mystery. It’s hard for me to imagine this formula succeeding. But if it doesn’t, I’m afraid it will be another nail in the old mystery/puzzle reality TV coffin, and the next attempt at resuscitation will be all the more difficult. Maybe it’s that Whodunnit? just felt like a reality show dressed in the costume of a murder mystery, without actually offering any of the gameplay or interactivity expected of the genre? I’d love to hear any comments from those of you who followed the show. Were you already a fan of shows like The Mole and MiSTX, and how did it stack up to your expectations? Or, if this was the first time you had seen a show of this type, what were your impressions having no preconceived notions going in besides the show’s own promotional materials? In closing, it was a fun summer show with some fun surprises and fun players and fun effects. I hope that, despite its flaws, Whodunnit? 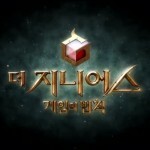 will prove to be a step forward for mystery games on TV. I liked the show but agree that it seemed weird that who the killer was seemed largely irrelevant given the way the show mechanics worked. I’ve been liking the currently airing season of The Mole Australia more than this show. Are you watching that? I forgot that there was going to be a new season, so I haven’t been watching! =( Is it available online? It would be fun to catch up before the end so I don’t spoil myself, haha!